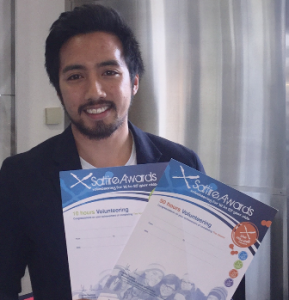 We’re delighted to share the news from Voluntary Action Scotland (VAS) that Volunteer Glasgow and all the country’s Third Sector Interfaces (TSIs – which include Volunteer Centre services) have awarded a total of 100,000 Saltire Awards since 2012. The Awards have made a significant contribution to a growth in volunteering amongst Scotland’s young people since 2009, enabling more young people to enjoy the benefits of volunteering for themselves whilst also making a positive impact on their communities. The Saltire Awards are the Scottish Government’s national youth volunteering initiative and in making the announcement of this milestone, Angela Constance (Cabinet Secretary for Communities, Social Security and Equalities) said: “We should all be very proud of the increase we have seen in our youth volunteering rate. I congratulate not only the volunteers but also the agencies, which are developing youth volunteering opportunities across Scotland. Commenting on a trend that looks set to grow, Allan Johnstone, Acting Chief Executive, VAS said: “While volunteering enables young people to contribute to their local communities in ways that are enjoyable, fun and creative, they also bring a fresh perspective and enthusiasm, offering valuable solutions to communities and voluntary organisations especially in challenging times. The increasing number of young people volunteering in Scotland is one of our collective Legacy 2014 success stories.